Do you have a garden pond? Or would you like one? 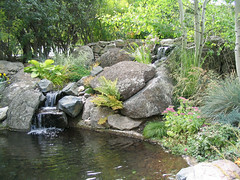 A garden pond or a water garden does not have to be large to totally change how you make use of your garden. The sound of running water is so soothing and a pond fountain or a waterfall can have a cooling effect on a hot summer’s day. Watching the fish carry out their daily lives is calming too and many gardeners like the chance to branch out into the new realm of aquatic plants. If your pond is sunk into the earth, your could watch it from above or you could build it above ground and use perspex windows to watch your fish on their own level. Your fish will breed too, so you will have a new, perfect, ecosystem in your own garden. Select the site of your pond with care. Try to position it on slightly higher ground, so that it is not flooded with all your garden’s rainwater in the course of heavy rains. Beware of putting your pond under a tree or you will always be raking leaves out of the water, which is a real pain. Siting your pond in a location where it is in at least partial shade when the sun is high will also help reduce on algae growth. However, once the contractor has constructed your pond and you have stocked it, is the time when your work commences. Maybe not work, maybe you will enjoy maintaining your fish and your fish pond. This is not hard and a largish pond will need hardly any maintenance at all, most of it can be mechanized. One of the first things that you will have to try to do is stop your garden falling into the pond. You do not want surrounding mud dropping into the pond and literally muddying the water. This can be achieved by lining your pond with a butyl pond liner and bringing the liner up over the lip of the pond by a foot or two. Then you need to keep that in place. This can be done to suit your taste, but many people put a stone or brick walkway around the pond. If you let this overhang the pond by an inch or two, you will almost totally hide the pond liner. Most people overfeed their fish, because fish outdoor will find a lot of natural food such as flies, larvae and grubs. This surplus food turns into a surplus of nutrients. This super-charged water is a perfect environment for algae, and algae is going to be your undying enemy. However, you can soak up some of these surplus nutrients with other plants that you are keen on. Aquatic plants such as lilies really make a pond and they will help aerate the water during the day when the water may be warmer (warm water contains less oxygen than cool water). Plants also give your fish somewhere to take cover from predators and strong sunlight, which will diminish stress on your fish as well. Owen Jones, the author of this article, writes on many subjects, but is now involved with water garden pumps. 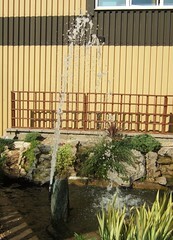 If you are interested in a Solar Powered Pond Pump, please go to our web site now for a special deal. If you’s like a garden pond but want someone else to build it and you live between Westville and Assagy call Matt on 084 712 5129 and he can take care of it for you. The Easy Way to Build Your Koi Pond Now! An easy step by step concise guide to creating block and liner koi ponds. This guide makes it easy, you can print it out and have it by your side. Would a water garden suit your garden? 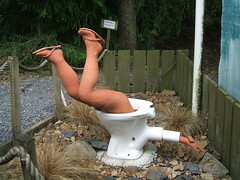 From time to time I am asked to help build a suitable water garden or water feature in a garden that my crew maintains. It can be quite a simple job to extremely challenging depending on the garden owners expectation. A simple water feature may involve a couple of pots, a few rounded boulders and a water pump to present a very attractive and pleasantly sounding addition to the garden. A birdbath and some driftwood with appropriate plantings can be very satisfying. An extended wetlands built with waterproof sheeting and all the plantings, rocks, pumps and engineering can be much more extensive, really great to have and pretty expensive to build. But the feature in the image above has to be the wierdest. Your neighbours need a sense of humour and don’t expect too many birds to visit. This is a much more attractive and orthodox water feature that would make any gardener smile and maybe crack an amstel at the end of the day.